Since I’m working part time now, and my husband is working extra, the deal is that I take care of everything in our home. Cooking, cleaning, shopping, finances, laundry, and basic maintenance. All he has to do is mow the lawn, snowblow or shovel the sidewalks when it snows, and help out with the occasional project around the house. (For example, we’re hoping to pretty up our landscaping this summer, I can’t do a lot of that on my own.) So I spent most of my day Thursday working from home, reconciling our finances, and cleaning the house. Honestly, most of those were things I did when I was working full time and I have no idea how I used to get it all done! I was exhausted, but the show must go on. With three hours left of my day, I decided I had enough time to get a workout in. On Wednesday, we got another 4 inches of snow, but I still chose to run outside Thursday. I didn’t really have time to drive to the gym to run. I layered up (It was about 30 degrees out and cloudy) and stuck to the middle of the street. It seems that everyone had boycotted shoveling this late winter snow (oh well, it’ll melt in two days anyway) so that was the only bare ground there was. Luckily, 2pm seems to be a very low traffic time in my neighborhood. I’d love to say that I had a great run, but I didn’t. I keep struggling with asthma-type symptoms while running. And it’s not the weather because it happened in San Diego too. Anyway, I completed 3 very slow miles. And then I came in and did the 15 minutes of “yoga abs” from Bob Harper’s Yoga for the Warrior DVD. Holy moly. That was a tough workout. After my workout I threw on some boots and a hoodie and ran some errands. Yes, I was that girl wearing leggings and boots in public. Shame, shame. It couldn’t matter, I had to get some groceries. You guys, I shopped without a list or even a plan. I walked through Aldi and grabbed a bunch of stuff I thought I could make into a few meals: cereal and almond milk, a frozen turkey breast, red potatoes, bananas, frozen green beans, whole wheat gnocchi, diced tomatoes and tomato sauce, refried beans, tortilla shells, eggs, shredded mozzarella, Italian turkey sausage, and some healthy snacks. I just can’t get into a cooking groove lately, so I’m going back to the basics: meat and veggies, Mexican, Italian, cereal, sandwiches and salads, and maybe even (gasp!) a casserole. My husband was actually impressed that I planned to make a turkey in the Crockpot for dinner Sunday. And I was working so hard to make all these healthy, whole meals. I’ll have to keep you updated on how this all plays out. 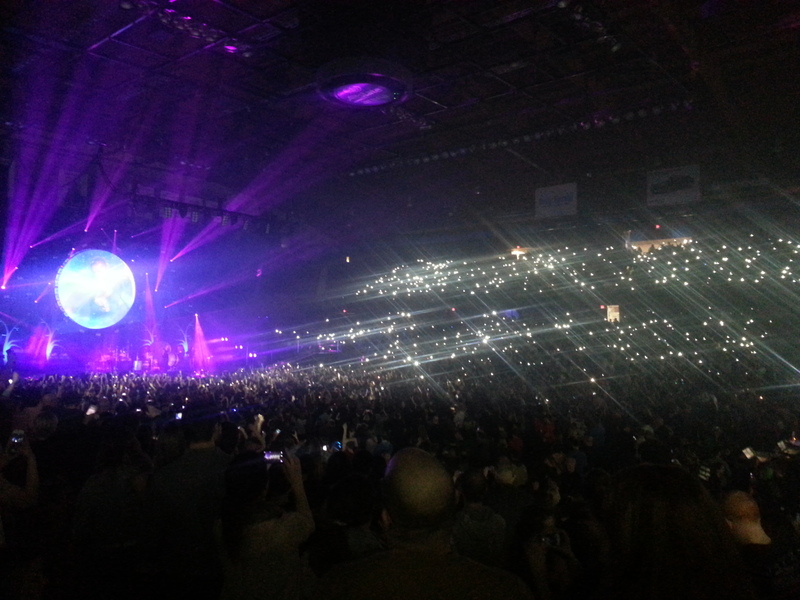 Cell phone lights twinkling like the night sky.